The Retro Freak – nice name – is another of those magical consoles that use cartridges allow a handful of older systems. More or less in the line of the Hyperkin machines as the RetroN 5, yes. The Cyber Gadget junks, in any case, have some important differences with respect to the Hyperkin. The first is found in its structure, since the Retro Freak consists of two blocks. On the one hand we have a small module that is the console itself, and on the other a hulk including slots for cartridges and most of the ports and connections. The console is inserted into the other large block and that’s when the magic happens. Is it worth if I have the Retron 5? I imagine that the most important question which one becomes when view the Retro Freak is if it is worth to go for it with the RetroN 5, and if what we want is to have many old systems at our disposal, so yes. The console offers several options related to the video signal and has a pair of USB ports to connect from keyboards to pads. Would you like to use it in your PS3 or PS4 controller? Go ahead. 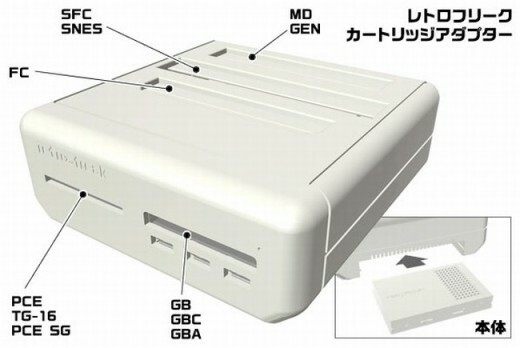 For now, the Retro Freak has only been announced for the Japanese market and still no release date or price is known.